Rebecca is an Advanced Pole Fitness Studios student and pregnant. 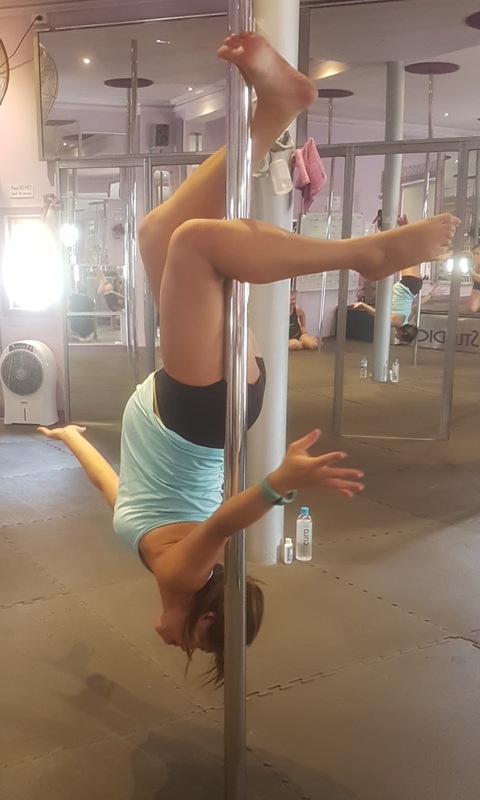 She certainly knows what she is doing and how pole gymnastics feels... If something doesn't feel comfortable throughout the set up then she can opt out of that exercise. Having so many exercises to choose from Bec is able to do an hour of options that she is super confident with. If you are keen to continue your pole training while pregnant, I recommend at minimum, being a seasoned beginner to intermediate level pole gymnast. Do not start while pregnant. Over the years I have dozens of students that have fallen pregnant shortly after starting pole. It must be the relaxed fun environment coupled with all that spinning and going upside down. If you are trying to get pregnant, see you in class! Pole Fitness Studios© is now a Multi Award Winning pole gymnasium, in the Local Small Business Awards! !